One day about fifteen years ago, when we stood watching the boys kicking around a soccer ball on the old Bethlehem Lutheran School playground (where the Dar Annadwa auditorium now stands), the ball went astray among a group of girls, doing what most 10-11 year old girls would do. Most stepped back to avoid getting hit. But Honey Thaljieh, stepped forward, and with the kick of her foot sent the ball flying, beginning a long journey that would take her around the world on an amazing adventure. From the Lutheran School playground in Bethlehem, Honey Thaljieh has emerged to revolutionize Palestinian attitudes about women’s sports and has taken up what one might call sports diplomacy, making it all the way to the White House with Hillary Clinton. so Amal's ten-year old kid-sister Honey and brother Issa would often tag along. Honey was an energetic and out-going child, full of self-confidence. 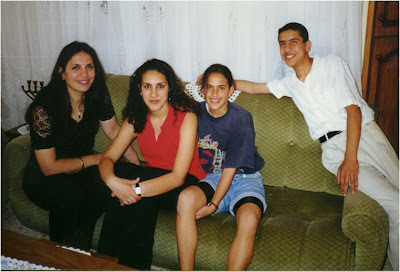 Here in the 1996 photo is young Honey with Issa and Amal (in red) and their mother Naheida (on left). We often wonder how the Israeli-Palestinian conflict affects children growing up amist strife and tension. The first intifadah spanned the years when Honey grew from three to eight. The second Intifadah corresponded to her late teen-age years. And she experienced some traumatic events living just a stone’s throw from the Church of the Nativity in Bethlehem--a cousin Johnny Taljieh was shot by snipers as he left worship after serving as acolyte. Honey found strength by faithfully attending church every Sunday, remaining active in Sunday School, Youth Group, Choir, and in the Lutheran School—there at the Evangelical Lutheran Christmas Church where Mitri Raheb is pastor. And Honey has made the most of it, completing her B.A. in Business Administration at Bethlehem University and becoming the head of the national sports programs for Palestinian girls—and rising as a role model for girls growing up in Middle Eastern society. 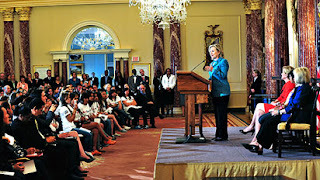 Sure enough when we checked the news online, we saw a Huffington Post story with the headline, “Hillary Clinton Launches Girls Soccer Initiative,” (Click on red links for news stories) and as we might expect, most of the quotes came from Honey. "It’s not only about playing football. It’s about living in Bethlehem, the city of peace, and delivering the message that we are humans and that we have rights," Thaljieh said. "Through football, we can change the world because football is a language that everyone understands." And ESPN reported a White House speech of the Secretary of State to a gathering of the U.S. Women’s National Team, and eighteen up-and-coming women stars from places like Pakistan, South Africa, and Palestine. 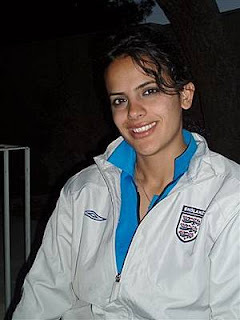 Honey, now 26, is serving as a coach, having thrown out her knee in her rugged style of play and still recovering. This week the athletes are competing in New Jersey and demonstrating their roles as ambassadors of good will. Up until 2003, soccer/ football was considered to be strictly a boy’s/ man’s game. But when Bethlehem University’s athletic director, Samar Mousa, had the idea of starting the first women’s soccer team, the first recruit was Honey, and she has taken the role of captain of every team ever since. There were plenty of obstacles. For a while, Honey became an object of town gossip. This wasn’t something that proper young women should be doing. Some people pressured her family, and, although they were generally supportive, they suggested for a while that it might be better for her to stop. But Honey persevered and the result was the first Palestinian women’s team. When a number of her teammates got married, they were pressured to make a choice, football or family. The National Team, like Palestinian society, is a model of interfaith relationships. Honey, of course, is Christian and so are other teammates, but the team is a mix of Christian and Muslim. Their uniforms are modest by inter-national standard with knee-length shorts. Several members wear tights or track pants. Most go bare-headed with pony-tails flying this way and that, but several wear a hejab on the field. There are also political barriers. As a national team, they wanted to have several players from Gaza, but it is impossible with lack of travel permits to practice together. So before their first international competition, they first traveled to Egypt where they could practice together. Honey manages to find a positive spin on these restrictive conditions due to occupation. 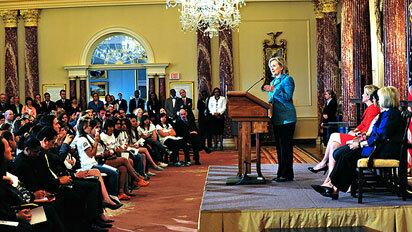 "We have no where else to go and nowhere to put our energies," she says. "We are just playing with our souls and spiritual abilities. It’s because we are strong, we are Palestinian, we face a lot of difficulties. We want to be something." The team is also at a disadantage in that there are no regulation-sized fields in Bethlehem to practice. Mostly they practice on the concrete surface handball court at Bethlehem university--a fact that has resulted in numerous knee injuries. Honey recently threw out her knee and is undergoing rehabilitation. When the team was ready for international competition, the first match was scheduled in Ramallah where they would host a team from Jordan. The venue was the 10,000 seat stadium where the men’s teams played. No one was disappointed, except those left in lines on the streets when the crowds—with a majority of women fans—filled the stadium to capacity. And the game? No one was disappointed. With the Palestinians leading most of the way, Jordan tied it 2-2 at the end. Perhaps that tie-score was a fitting message about what was accomplished. The match was featured in a New York Times story. The Palestinian team has now played in a number of regional tournaments in Amman, Abu Dhabi, and Europe. Through her work with PACES (Palestine Association for Children's Encouragement of Sports), girls teams in soccer and other sports are popping up across the West Bank--though a few areas continue to resist . There is also a women’s soccer league representing major cities. Currently in first place is the team sponsored by the Lutheran Church in Bethlehem’s Dar Akalima/ Diyar Consortium. 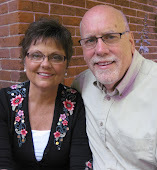 See their webpage. As would be expected, Honey captains the team. Honey is the ideal role model for young Palestinian girls. Her "captain" armband is a reminder how she has always been a leader. 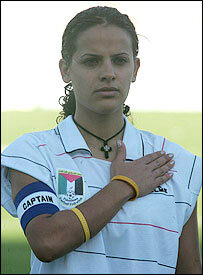 The Palestinian patch on her jersey brings forth her patriotism and her role as a Palestinian ambassador of goodwill. And most of all, the cross around her neck, both on the field and off, witnesses to her strong Christian faith. Who would have dreamt such a story when a ten-year old Honey stepped forward to kick that soccer ball back to the boys on the Lutheran School playground in Bethlehem?